For the past several years I have been forced to start using a walking stick for better balance and stability. When people ask, I tell them that I get unsteady when I drink too much. That usually stops any further questioning. The first one that I made was a salvaged branch from our backyard apricot tree that finally died after years of supplying us with a bountiful supply of apricots. See number 2 in Figure 1. I took it everywhere with me and I was always getting compliments on it. That prompted me to get into the “business” of making walking sticks. I don’t make them for sale; just for my own use. The next one that I made is number 1 in Figure 1. It is made from a length of 1-1/2″ diameter birds-eye maple Hollowood. Hollowood is 4-ply plywood tubing that I used to sell when I was in the custom branding iron business a few years ago. Sadly, the Hollowood company went out of business several years ago and the material is no longer available. I added a cast replica of a baby seal head and also a series of rawhide windings and some replica Indian feathered bells. The story is that the American Indians would convert the white man’s tin cans into small, cone-shaped “bells” and then decorate them with feathers. They make a nice tinkling sound when I walk with it. 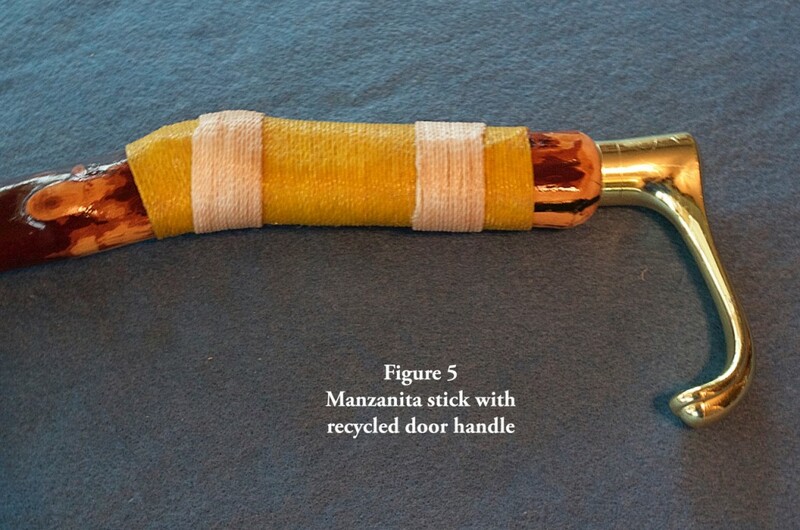 Number 3 in Figure 1 is made from Manzanita to which I added a recycled brass-plated door handle. 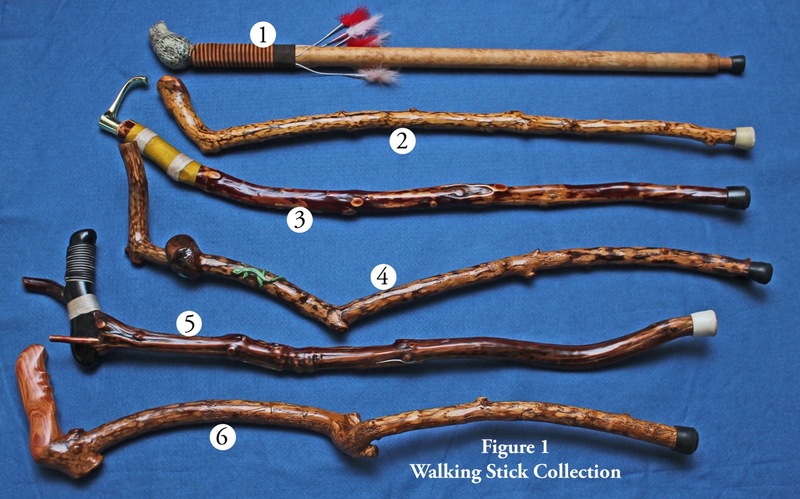 I think this is a great idea for making walking sticks. 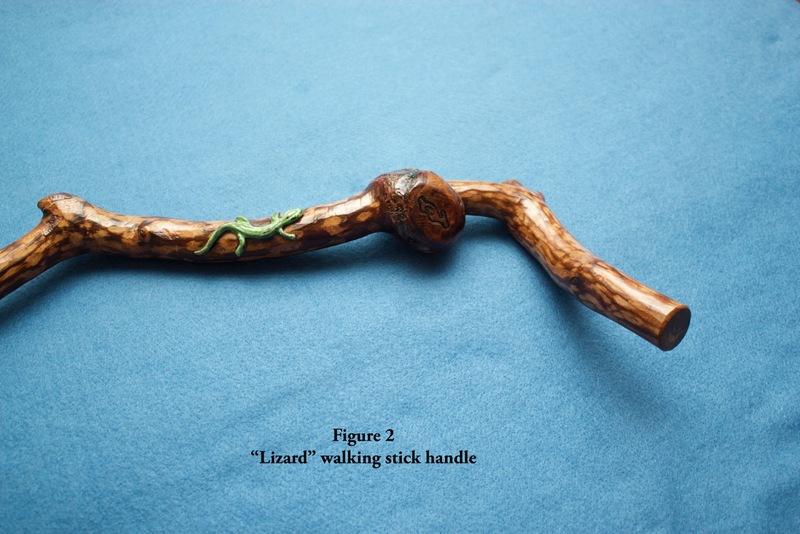 You can buy walking stick handles online but most of them are pretty expensive. Instead, I nose around in thrift shops and recycling centers. Many towns have companies that recycle all sorts of good stuff from old buildings. 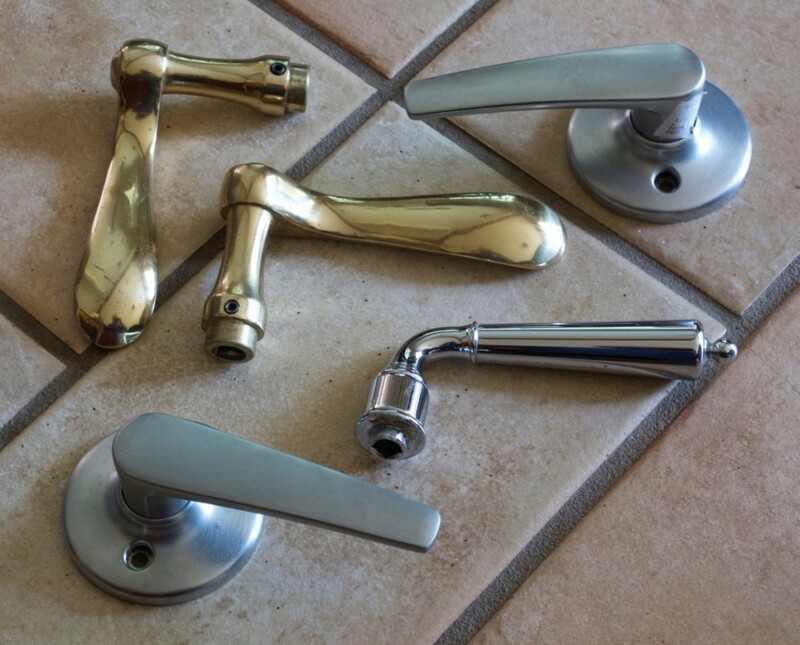 They usually have a good selection of door handles for only a few dollars. Number 4 in Figure 1 is made from two pieces of unknown wood. The original walking stick ended at the large burl seen at the longer end of the stick. The stick never quite satisfied me and I later modified it by adding the smaller section on the left. I embedded some turquoise here and there and then I bent and formed a cast metal lizard to fit the stick and glued him in place. Number 5 in Figure 1 is made of Manzanita and mahogany and probably took me the longest time to complete. I added the mahogany handle at the branch end of the stick. It may not be immediately clear, but there are three branch ends coming out of the handle. (One of them is “buried” inside the custom-carved mahogany handle). The handle itself has seven coats of black lacquer and is wound with alternating rows of black and white polyester cord. Number 6 in Figure 1 is made of an unknown wood with a custom-fit tulipwood handle. The handle is actually made of three pieces – two pieces of book-matched tulipwood with a thin holly strip between them. Each of my sticks has some different kind of handle on it. See Figure 2 for the way that I added a supplementary handle to the original stick that ended at the burl-like knob. 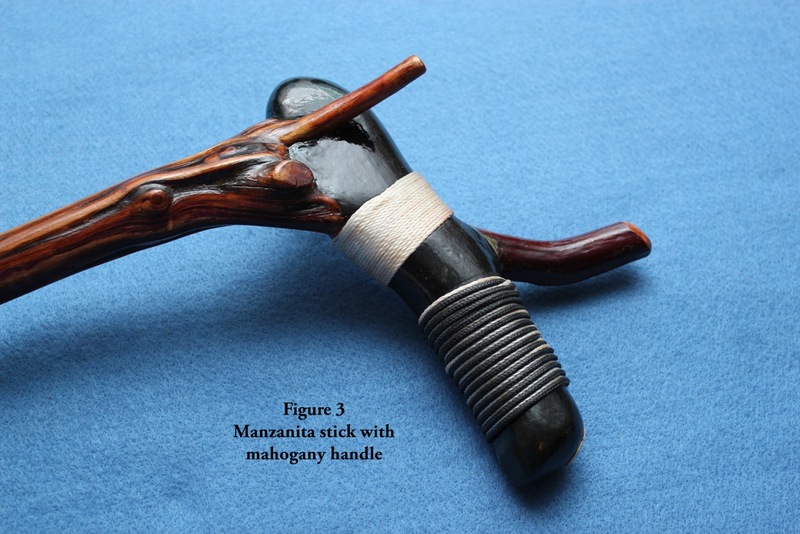 Figure 3 shows the detail of the stick with the mahogany handle. 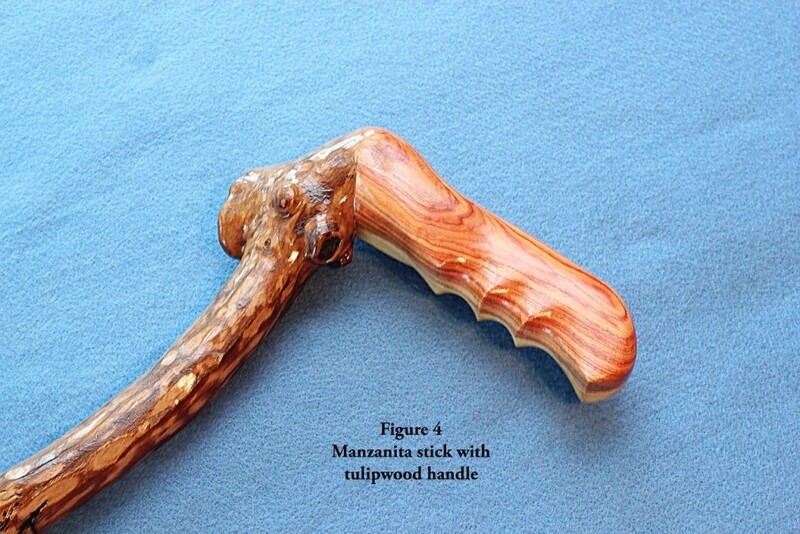 Figure 4 shows how I used a beautiful piece of book-matched tulipwood to add a handle to the stick. Lastly, see Figure 5 for the way I used a re-cycled brass-plated door handle as a handle for my stick. All of the sticks are branded with my personal maker’s mark that I use on all of my work. I also have added my email address to each of them with a pyrography pen hoping that it will be returned if I ever forget it somewhere. In addition to adding appropriate handles to my sticks, I also try to add some kind of an interesting or unusual touch to each stick. 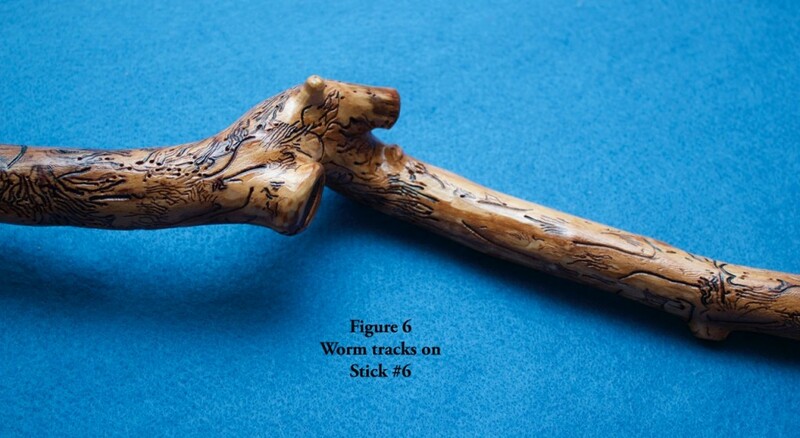 See Figure 6 for how I emphasized the worm tracks I discovered on the stick when I removed the bark.